Uncategorized – Biscotti and a Ph.D.
Black Friday Deals from Your Couch! I don’t know about y’all, but I DO NOT go out shopping on Black Friday. I have no patience when it comes to crowds, and personally, I’d much rather just sit on the sofa and order everything online. Hey, y’all! Sorry for the absence (I had been doing so well with scheduled posts!). I’ve been MIA because of Hurricane Florence. 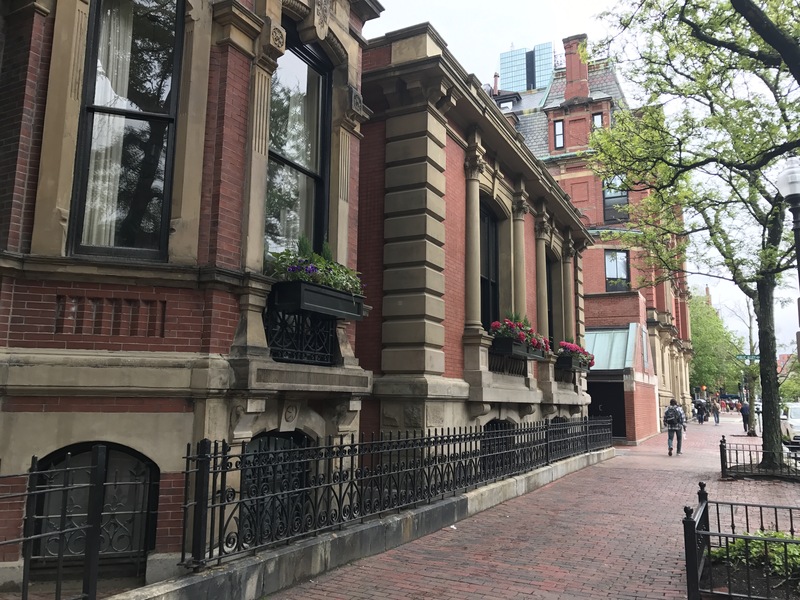 A few weeks ago I traveled to Boston for the annual American Literature Association conference. This is the second trip I’ve made solo to Boston! It seems like every time I go to Boston all it does is rain, but I try to make the best of it. I chose to fly out of Raleigh at 6am on Thursday (which meant I had to leave the house at 3am – gross) because my dissertation director was presenting at the conference. It’s been three years since I’ve seen him, so the early flight was worth it. I’m usually pretty organized when it comes to travel, but I hadn’t figured out a way to get from the airport to my hotel. Oops. After about ten awkward minutes of standing in baggage claim, I decided the train was the cheapest, safest, and most effective choice. I’d like to apologize to the men (yes, multiple) I almost wiped out with my luggage. Sometimes I procrastinate so much that the conference hotel gets booked before I can get a room, but I made sure to reserve mine in time, and I’m so glad I did! The Westin Copley Place was a beautiful hotel, and I kind of felt like a queen in the room! 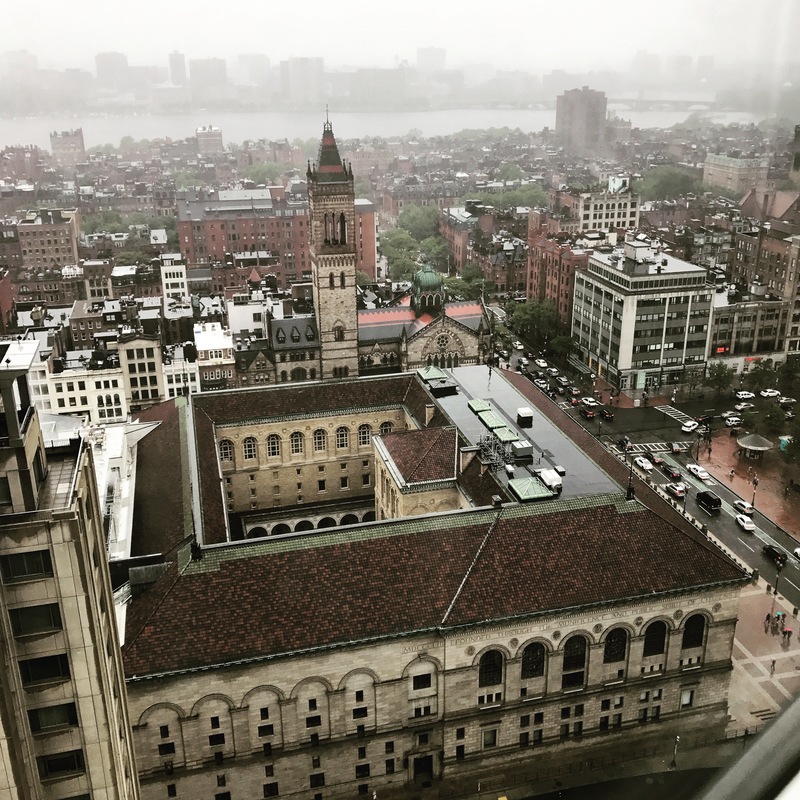 Another plus about the hotel, especially in rainy weather, is that it connects to so many other buildings (Copley Place, The Shops at Prudential Center) that you can spend hours shopping, walking, and eating (and staying dry). I could see the bay from my hotel window, so on Saturday it seemed like a good place to visit. And it was! The rain stopped for a bit and it was really nice to get away from all the people and noise for a few minutes. 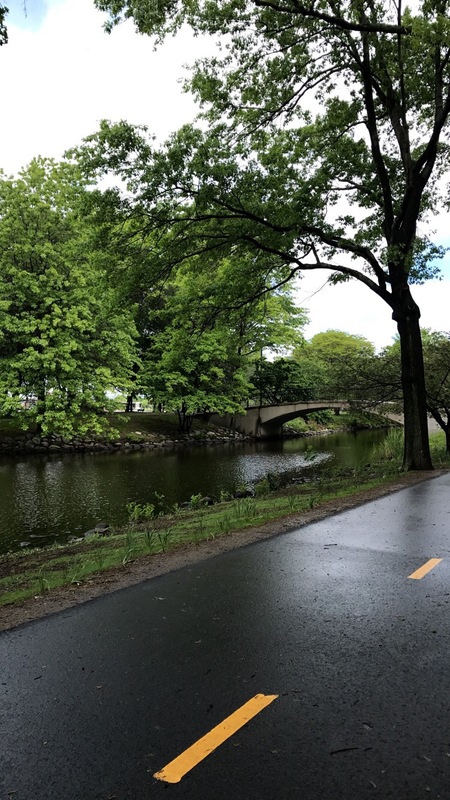 The Charles River Esplanade was a beautiful location for a walk, and several runners and bikers had the same thought as me – to enjoy the break in the rain while they could. I couldn’t not eat seafood while in Boston. My first clam chowder was in Boston several years ago. This time, though, I was craving shrimp. 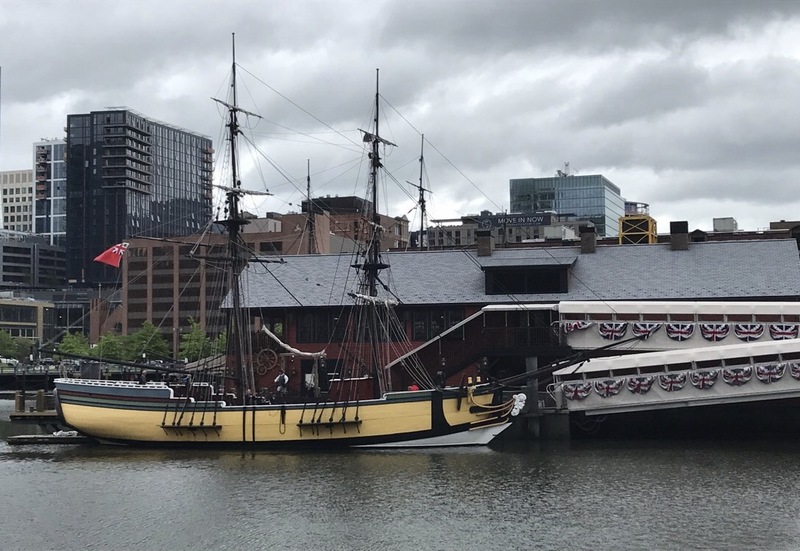 After a ton of searching online, I thought my best option would be to hit Legal Seafoods on the harbor so I could also visit another part of Boston and view the infamous tea party ship. 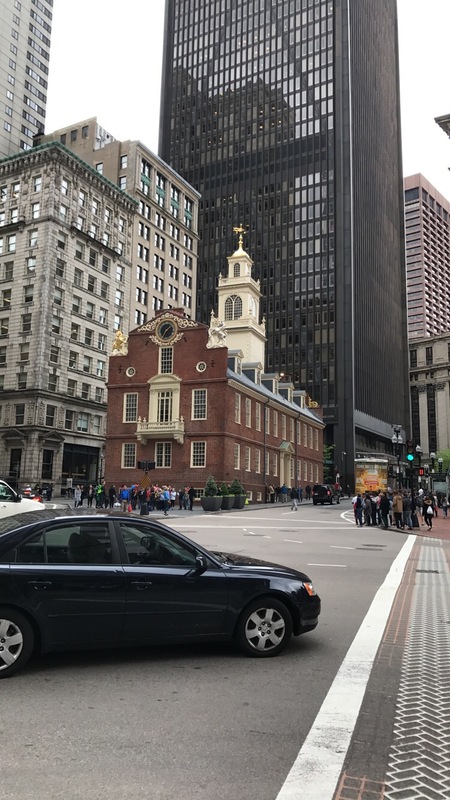 It was a fun surprise to see the Old State House when I came out of the train station. 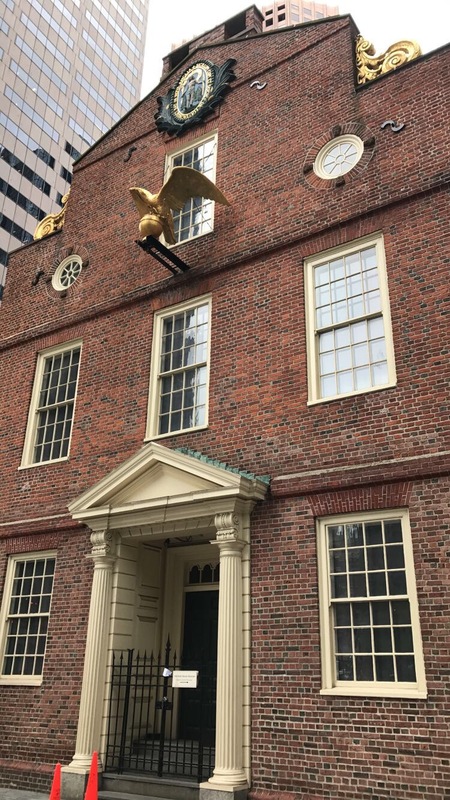 Fun fact: The Declaration of Independence was first read to Bostonians from the balcony of the Old State House. After a bite for lunch (see the next post! ), I walked along the marina and made a stop at the infamous Boston tea party ship. Every time I see this ship I’m surprised at how small it is. 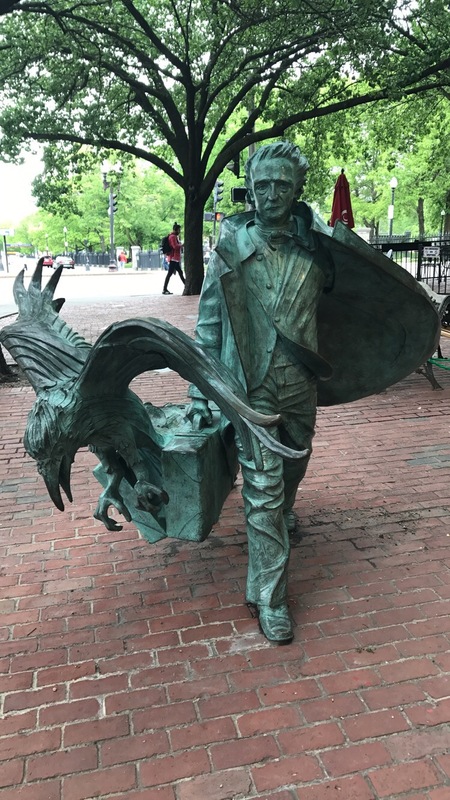 The first year I went to ALA I missed the walking tour of Poe’s Boston, so I was determined to do it this year. My conference presentation was scheduled to end ten minutes before everyone was meeting, but I was convinced I could make a quick change and sprint to the location. And of course I can’t miss walking through an old cemetery. 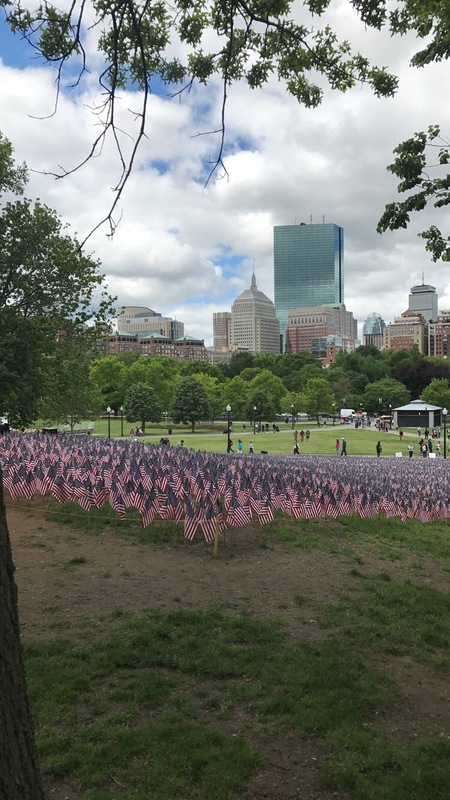 Since it was Memorial Day weekend, there were American flags everywhere! 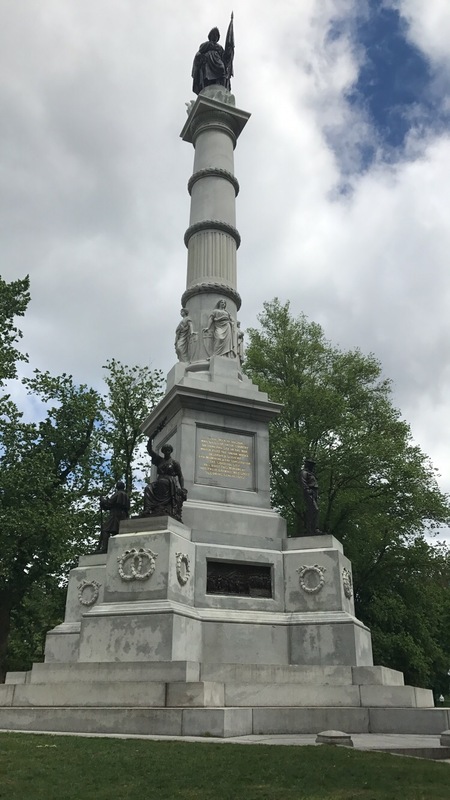 In the middle of Boston Common is a memorial to soldiers who fought and died in the American Revolution. The Freedom Trail also goes around this area, which I highly recommend doing! Looking back at all the monuments and historic sites makes me want to go back with a more organized plan. The Freedom Trail even offers a Revolutionary Women Tour which I will certainly be doing on my next trip to Boston! 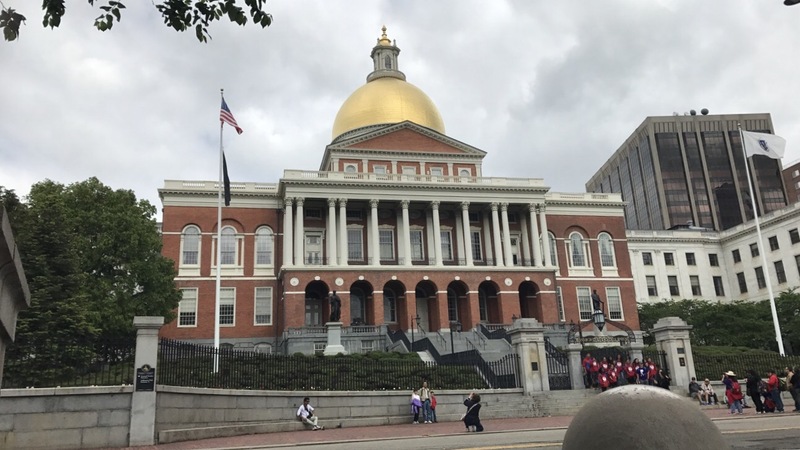 And I couldn’t leave without strolling up Beacon Street to see the beautiful Massachusetts State House! 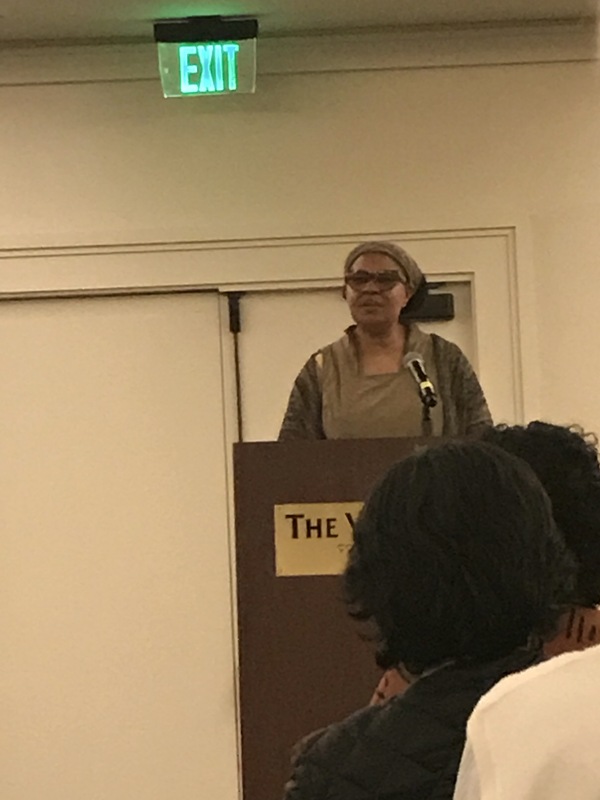 The most amazing part of the trip and the conference was hearing Jamaica Kincaid read from her newest book! I teach her prose poem “Girl” in my World Literature class, so I’m excited to show my class the pictures of her. If you don’t know who Kincaid is, you should definitely look her up, it’ll only take you three minutes to read “Girl” and it’s worth it! Boston is always a fun trip for me because I love how deep the history runs. 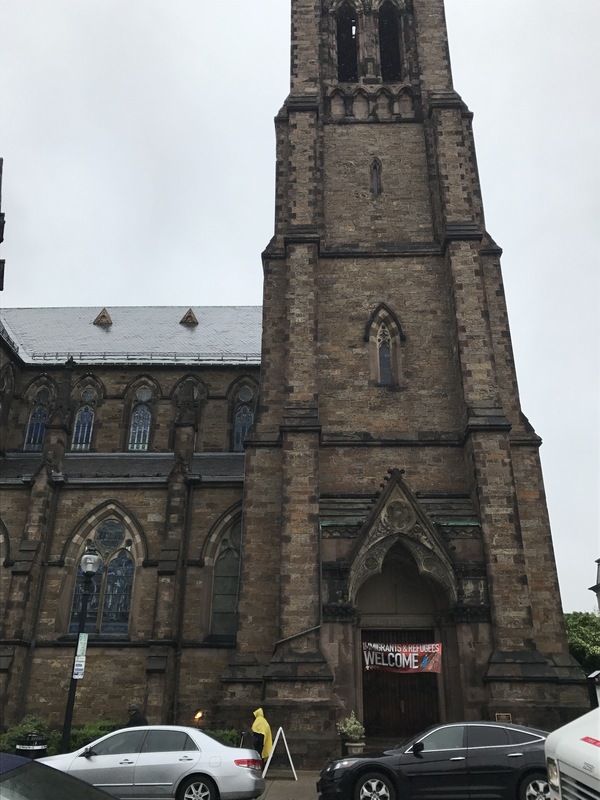 What are your favorite landmarks to visit or tours to take in Boston? I thought this Disney trip would never arrive, and now I feel like it’s been so long since I went (because it has been)! 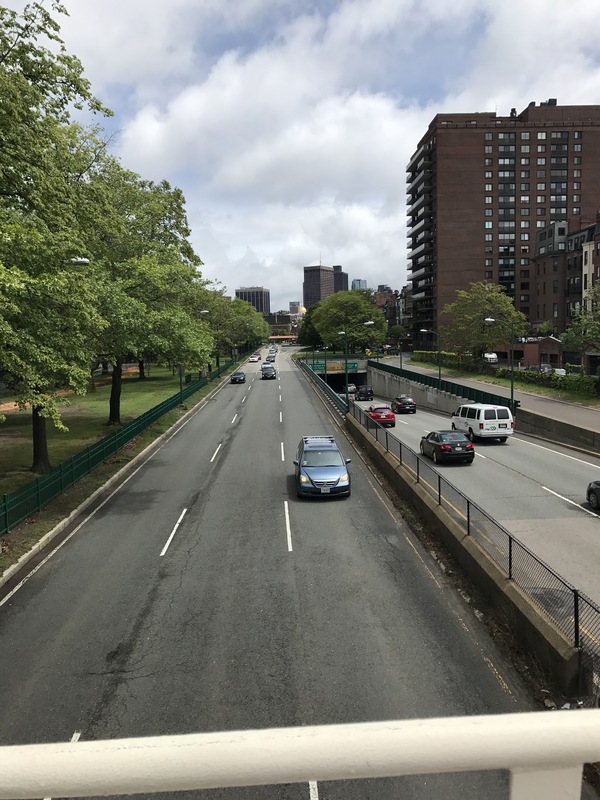 I spent the entire summer planning – where will we eat, what will we ride, which park should we visit on each day – and I definitely think that thorough planning paid off. Hurricane Matthew hit our part of North Carolina the weekend before we left. I felt incredibly guilty going on a fun trip knowing so many people had lost everything. It ended up being a good for us though since we didn’t have power for most of the week. We drove down on Monday, October 10, stopped at FishBones in Orlando (per boyfriend’s request), and finally made it to our room at Port Orleans Riverside. 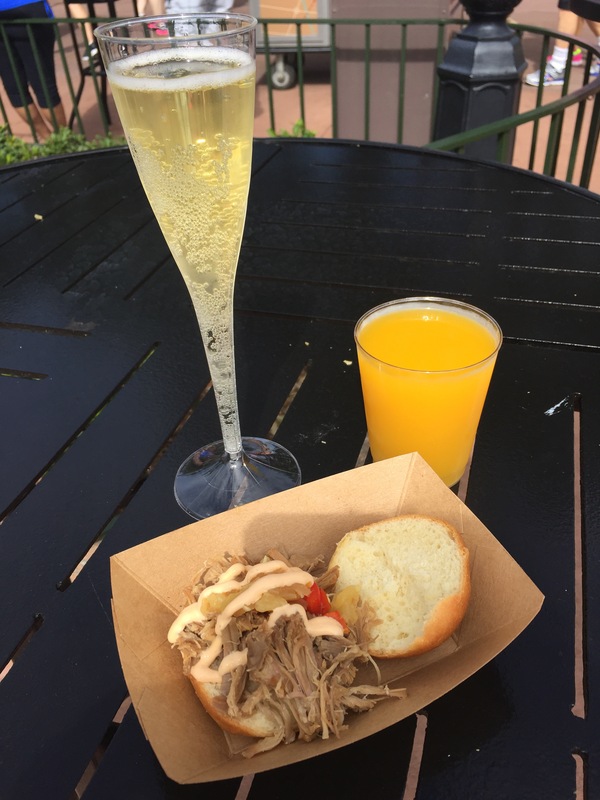 On Tuesday we visited Epcot for the International Food and Wine Festival (official Disney info at that link). We didn’t plan our trip during the festival on purpose, but I was so pumped that they coincided because I LOVE FOOD. 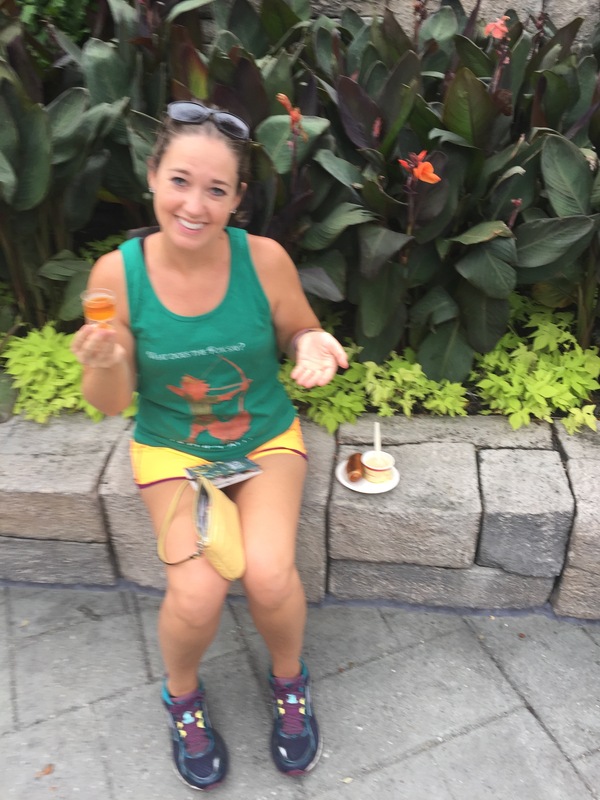 I had done some heavy research (I get slightly obsessed with planning) on the festival – what food and drink would be offered and prices – but it ended up being fun just walking around and eating whatever we were in the mood for. Be sure to get a stamp book to remember the dishes and drinks you try from each country! 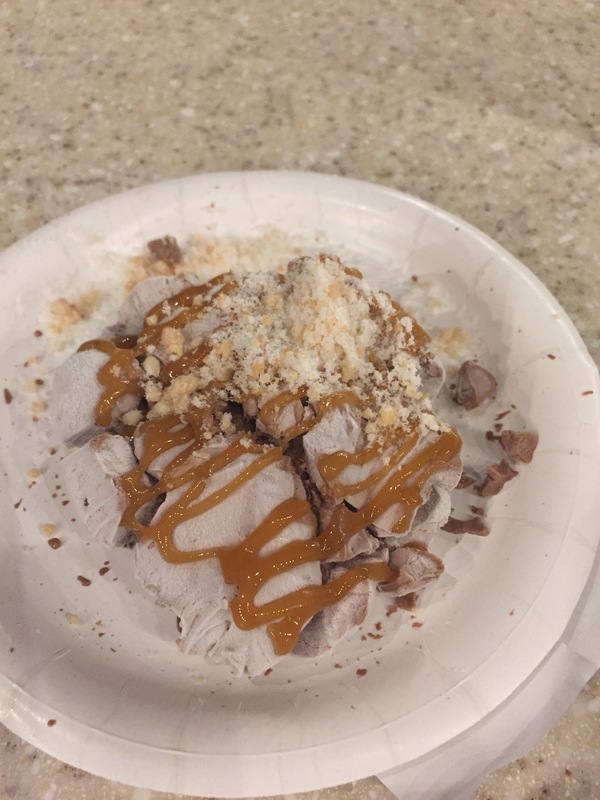 I think the food and drinks above from the Hawai’i kiosk were my favorite sampling. 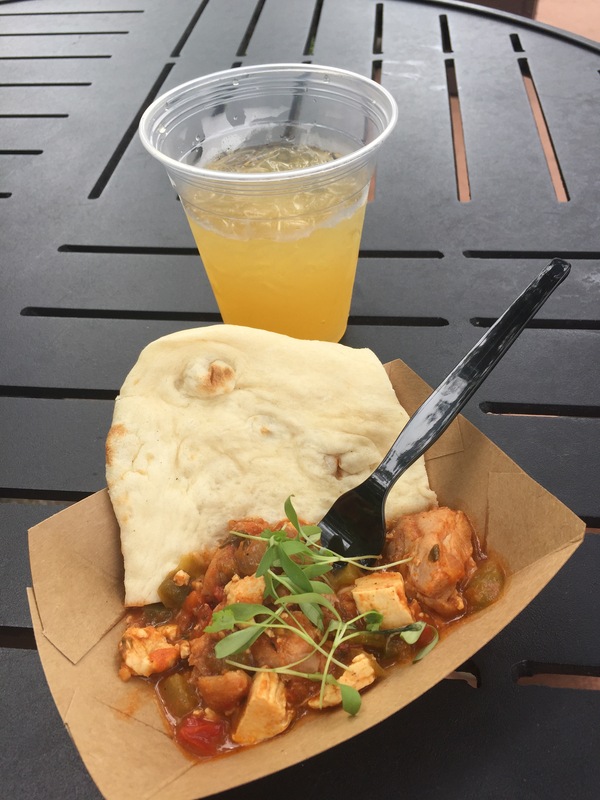 Boyfriend still talks about the chicken (pictured above) from the Africa outpost. Frozen Szarlota (apple pie and vodka) from Poland. Amazing. I got annoyed that boyfriend wanted sushi (my argument was he could get that anywhere), but I also didn’t want to be bossy, so sushi it was. I didn’t try this because I don’t do raw fish; I don’t think he was blown away though. 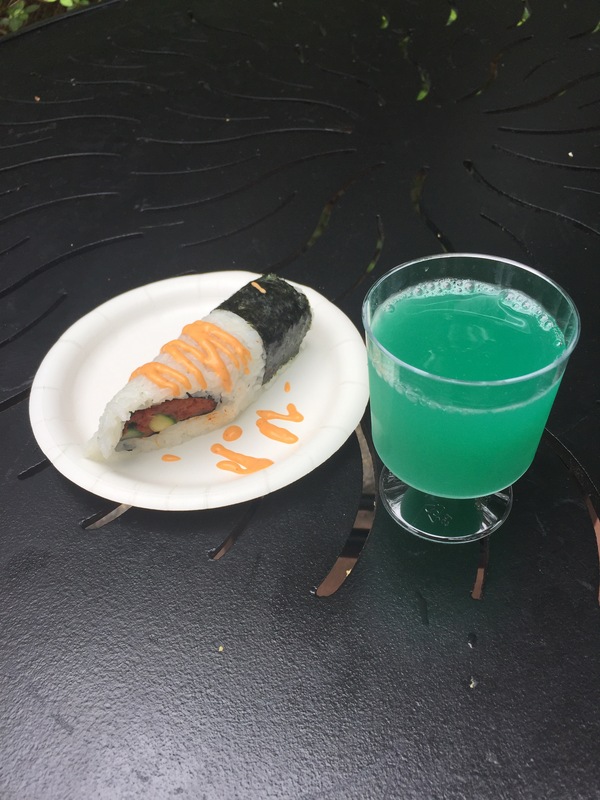 The blue sake on the other hand? Yum. I went a little Moroccan-crazy. 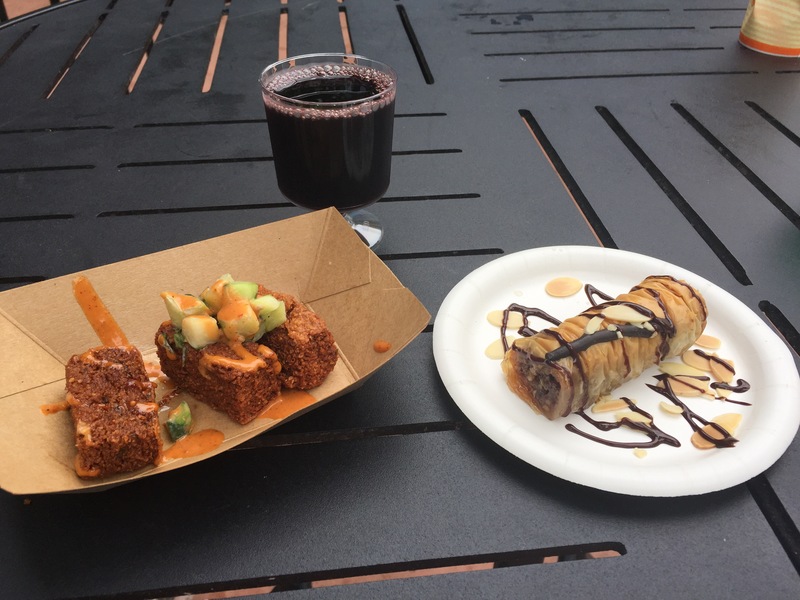 The spicy hummus fries and chocolate baklava were delicious; the sangria was meh. I didn’t get an up-close pic of Canada’s beer cheese soup, and you may need a magnifying glass to see that baby-size apple ice wine. I’m glad I tried it, but for $8, one time is enough for me. 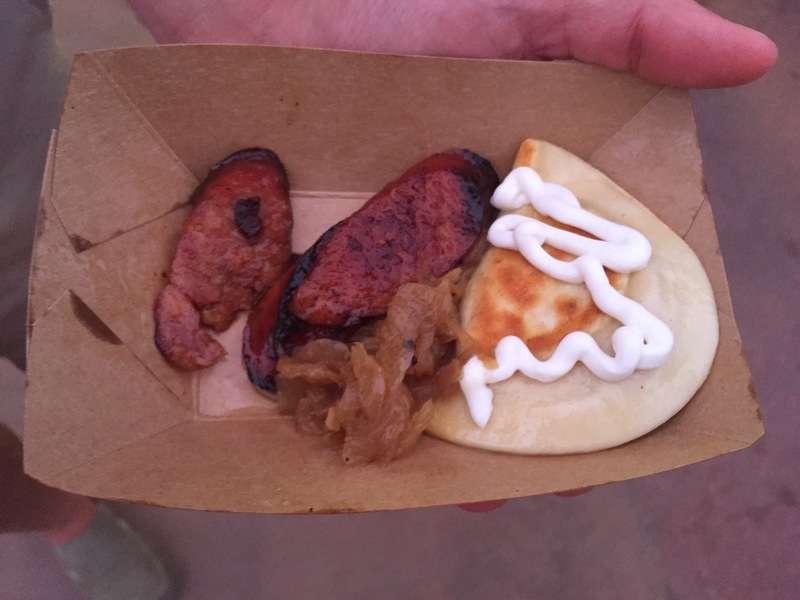 Kielbasa and Potato Pierogi from Poland – delicious! Our final snack of the night was this Nitro Truffle. It’s frozen and boyfriend had a difficult time chopping off pieces (and earned my stank eye when he sent a huge chunk flying into the grass 😑). 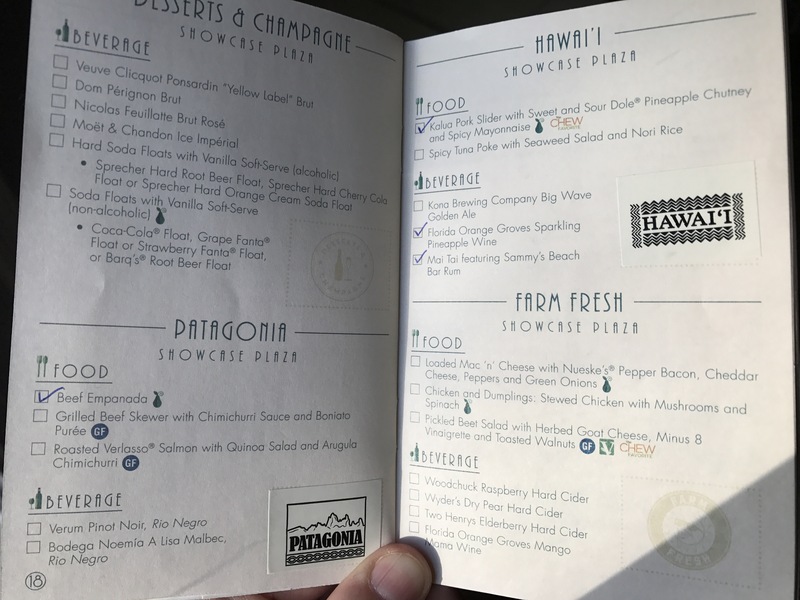 I didn’t get a picture of the Beer-braised Beef served with Smoked Gouda Mashed Potatoes from Belgium, the Grilled Sweet and Spicy Bush Berry Shrimp from Australia, or the Beef Empanada from Patagonia, but they were all delicious. Trying all the food and drinks definitely adds up money-wise. We bought Disney gift cards from Target (hello 5% Red card discount!) and it was sad to see how quickly the money went, but we had a blast and would definitely do it again! 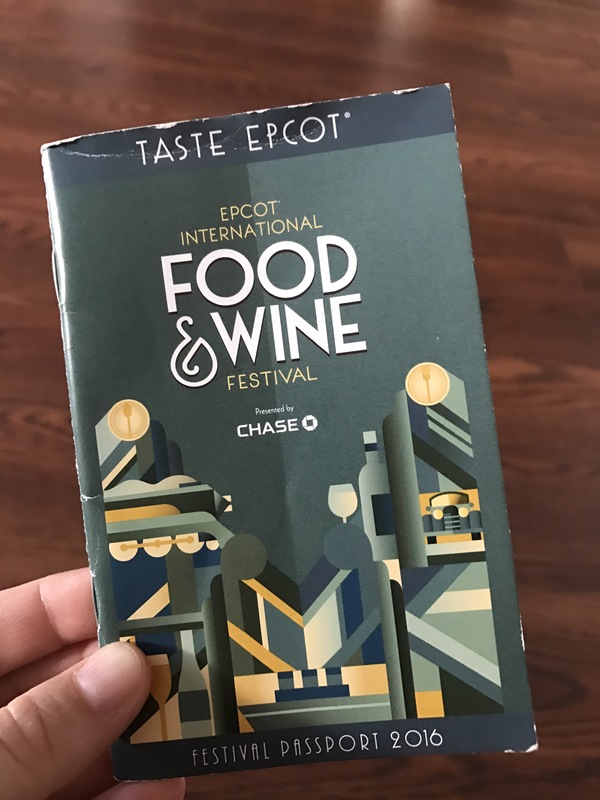 If you’ve been to the Food and Wine Festival what would you recommend? 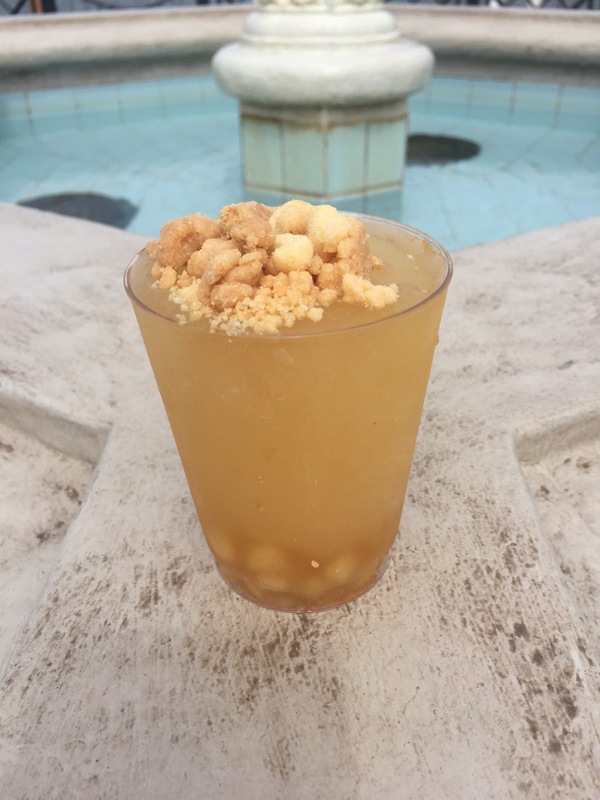 What were your favorite drinks or snacks?